Red Hippo: i've been eating, cooking, reading, browsing, and buying…oh, and knitting! i've been eating, cooking, reading, browsing, and buying…oh, and knitting! i am still eating [mostly] vegan. i've had a couple of slip-ups. once my slip was on two HUGE homemade chocolate chip cookies- i don't regret it for one minute. the second was Super Bowl, when i ate a couple of vegetarian stuffed mushrooms and some spinach balls which had egg. other than that- it's vegan all the way. my favorite daily treat is a "chocolate" shake made with spinach, blueberries, and cocoa powder (among other things). i have been making a really fabulous veggie soup with a carrot juice and water base. i add as many veggies as i have in the fridge, lots of herbs, and cashew butter (which i blend in the food processor with two cups of the veggie soup that has been cooking). the cashew butter mixture makes it "creamy." it's really delicious and so so healthy. i've just started Taking Back Childhood, written by Nancy Carlsson-Paige. the book is about how to raise confident, creative, compassionate kids. i bought it when i was pregnant with easton after i heard an interview with the author on NPR. so far, so good. i've been knee deep in searching for sofas. we need need need a sofa. i was finally about to pull the trigger in macy's last night, but the couch is out of stock until may. i just can't wait that long…so the search continues. i have made two purchases in the last few days. an ottoman which matches our west elm love seat and two custom frames for two pieces of art that i've had for a really long time. i can't wait to put those bad boys on the wall. 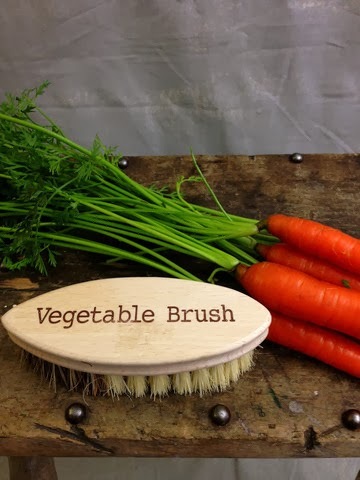 i also purchased a fabulous veggie brush! i've just finished a scarf for tony and an infinity scarf for….someone. i'm not sure who the lucky recipient will be. i'm also working on a smaller version of the scarf i made for tony, for easton. he is really excited about it!